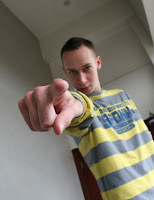 Anthony Abuse from the south of Netherlands was 15 years of age when he got in touch with producing electronic music. The music he was producing at that time was Hardstyle. After a year or 2 the interest for listening Techno became bigger and bigger and at the age of 18 he fell in love again. Techno had taken over his life. When starting producing Techno he realized that this was a lot more complicated than Dj-ing. He likes the Harder Techno styles and this will show in his productions.